SUPERMAN #38 CGC 8.5 OFF-WHITE TO WHITE PAGES !!! 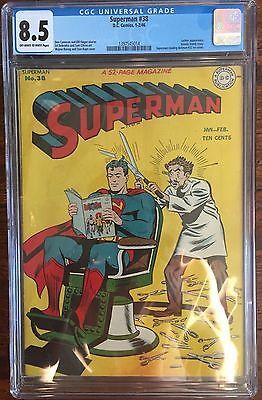 Up for auction is Superman #38 CGC 8.5 off-white to white pages. There are no returns on this item. Item is purchased "As Is". Shipping within the US add $16.50. Item will be shipped US Post Office Priority Mail withsignature confirmation. Depending on the destination, item may be shipped Priority Mail Flat Rate. I welcome international bidders, but international bidders will bear the risk of damage if thepackage is lost or damaged. International shipping add $25.00. Shipping to Canada would be much less than overseas.